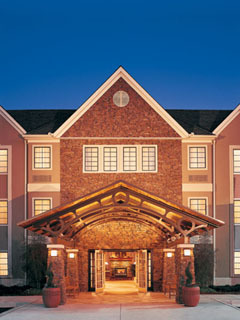 Staybridge Suites by Holiday Inn located in Allentown, PA next to the Lehigh Valley International Airport and Lehigh Valley Industrial parks. We are an all suite hotel designed to let you feel more comfortable than ever before. Each suite is designed for maximum flexiblity and adaptability to meet your specific needs. All suites feature fully-appointed kitchens, including a microwave, dishwasher, 2 top burner stove, garbage disposal, coffee maker, cookware & dinnerware. Also in our one bedroom and two bedroom suites, we have a pull out sofabed. Our on site Convenience Store, Laundry Room, and Business center are open 24hrs a day. A breakfast buffet is included complimentary daily or if preferred, choose Staybridge "On The Go" Continental breakfast bagged to go. We also feature a complimentary "Sundowner" reception three evenings that include soft drinks and appetizers from 5:30pm until 7:30pm. We are less than 6 miles to Dorney Park Amusement Park.